Americans are sending a record number of women to legislatures around the country. Women in key swing districts across the country delivered congressional victories to the Democratic Party Tuesday, helping to shift the balance of power in the U.S. House of Representatives for the remaining two years of the Trump presidency. The U.S. may be divided along political and ideological lines, but Associated Press exit polls show female voters united behind the Democratic Party in the 2018 midterm congressional elections by a 55 percent to 41 percent margin. The partisan divide among male voters was much narrower. In a midterm election cycle heralded as the “Year of the Woman” because of the record number of female candidates for office and the surging #MeToo movement, women delivered a generally harsh verdict regarding Trump’s first two years in office. FILE - People participate in the Women's March on Washington, following the inauguration of President Donald Trump, in Washington, D.C., Jan. 21, 2017. The 2018 elections marked the first time voters went to the polls nationwide since Trump defeated Democrat Hillary Clinton in the 2016 presidential election. 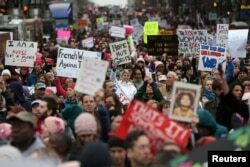 The Women’s March that brought out millions of female protesters the day after President Donald Trump’s inauguration also fueled so-called Indivisible groups, an anti-Trump resistance, across the nation. Those Indivisible groups supported a new wave of female candidates. When the new Congress is sworn in early next year, a record 96 women will serve, according to the latest election projections. That number is up from the 84 women currently serving in the 115th Congress. Gender equality was an important issue for women in this election, according to a June 2018 survey for Gender Watch 2018, a nonpartisan project tracking gender dynamics this election season. But other issues, including health care, immigration and the state of the economy all played a role in voter decision-making. Moreover, only a third of all voters said Trump had the right temperament to serve as president, according to AP exit polling. Central American migrants begin their morning trek as part of a thousands-strong caravan hoping to reach the U.S. border, as they face the Pico de Orizaba volcano upon departure from Cordoba, Mexico, Monday, Nov. 5, 2018. In the days leading up to the election, Trump said his sharp focus on immigrant caravans moving north toward the U.S.-Mexico border, and the threats he contends they pose, would appeal to women. But that approach did not ultimately appeal to women in swing districts across the country. O’Rourke noted that women favored Democratic candidates in congressional matchups by 19 points. “It was really on the shoulders of women voters that Democrats had the momentum to take back the House,” she said. FILE - Virginia Congressman Dave Brat, R-Va., left, shakes hands with Democratic challenger Abigail Spanberger, right, after a debate at Germanna Community College in Culpeper, Virginia, Oct. 15, 2018. Democrats regained control of the House on Tuesday for the first time in eight years, 221 to 196, by picking up 26 seats previously held by Republicans. In many of those races, women from suburban swing areas played a decisive role in the outcome. For instance, in three congressional districts — Virginia’s 7th and 10th, and New Jersey’s 11th — women provided voting strength that flipped Republican-held seats. Virginia’s 7th, a district split between rural areas and the suburbs of Richmond, shifted by 17 percentage points in favor of Democrats between 2016 to 2018, delivering a win to the Democratic candidate, Abigail Spanberger. The former CIA officer beat Tea Party incumbent Dave Brat in no small part through the activism of local liberal women’s groups. Democrat Jennifer Wexton speaks at her election night party after defeating Rep. Barbara Comstock, R-Va., Nov. 6, 2018, in Dulles, Virginia. In Virginia’s 10th, Democratic lawyer and state senator Jennifer Wexton beat two-term Republican Rep. Barbara Comstock in a district that went for Clinton over Trump in the 2016 presidential election, 52 percent to 42 percent. Flipping these so-called “split districts” divided between Democratic presidential support and a Republican representative was a key element of the Democrats’ strategy to take control of the House in 2018, according to analysts. Former Navy pilot Mikie Sherrill flipped New Jersey’s 11th away from Republican Jay Webber, giving Democrats control of the district for the first time in 36 years. Rates of female voters have equaled or exceeded those of men for decades, according to a study by the Center for American Women and Politics. Women are also more likely to identify as Democrats or lean Democratic, according to a 2018 Pew Research Center survey. A majority of women identify as Democrats or lean Democratic at 56 percent, while 37 percent affiliate with or lean toward the GOP. The share of women identifying as Democrats or leaning Democratic is up 4 percentage points since 2015 and is at one of its highest points since 1992. In 2014,the most recent off-presidential midterm election year, Democrats won the U.S. House vote among women, even though Republicans overwhelmingly secured overall control of the chamber. Analysts warn against viewing women as a monolithic voting bloc. Race and ethnicity also provide further divisions within groups of female voters. Fifty-two percent of white women voted for Trump in the 2016 presidential election, and studies show female support for the president has held consistently, although college educated white women generally oppose Trump. Rebecca Gill, a professor of political science at the University of Nevada, Las Vegas, says white female voters are harder to classify because their vote often depends on their level of education and marital status. As the focus now turns toward Trump’s re-election run in 2020, Republicans recognize they have a problem to address. Republican Sen. Lindsey Graham told Fox News Tuesday night after projections showed Republicans had lost control of the House. “We’ve got to address the suburban women problem, because it’s real,” he said.